Apple announced three new iPhones last year: the iPhone 8, the iPhone 8 Plus, and the high-end iPhone X. Those three phones start at $700, $800, and $1,000, respectively. The most expensive iPhone model, the iPhone X, in many ways represents the future of the iPhone. But it’s not for everyone. Simply, you can save at least $200 by going with an iPhone 8, which, keep in mind, is still a brand-new phone from Apple, with most of the same features as the iPhone X. From a functional standpoint, the iPhone 8 and the 8 Plus are identical to the iPhone X. Each phone is powered by Apple’s new A11 Bionic chip, a neural engine, and the M11 motion coprocessor. The only difference is how the phones use these features: The iPhone X uses the A11 chip and neural engine for its new face-detection system, Face ID, which the iPhone 8 does not have. Touch ID, which is used to unlock the device and pay for goods via Apple Pay, is a known, proven entity. I own an iPhone X, and Face ID works well most of the time – but as my colleague Tony points out, Face ID is less reliable than Touch ID, and not as fast. Face ID is very good. Apple says it’s less prone to being tricked than Touch ID, and can work in most situations where you think it wouldn’t: in the dark, if you add hats or glasses, or if you make actual changes to your face. Still, Touch ID is comfortable to use, works almost instantaneously, and doesn’t require you physically look at the phone. Face ID has a ton of potential, but Touch ID is still the gold standard. The iPhone 8, iPhone 8 Plus, and iPhone X all support the Qi wireless-charging standard, as well as fast charging. The downside, unfortunately, is that you’ll have to buy extra accessories if you use either new charging method with any of these new iPhones. Apple offers several Qi wireless-charging pads (its own AirPower pad won’t be out until later this year), and you’ll need to buy $25 to $75 worth of equipment (a Lightning-to-USB-C cable and a USB-C Power Delivery-compatible charger, specifically) if you want to use fast charging for your iPhone 8, 8 Plus, or iPhone X. 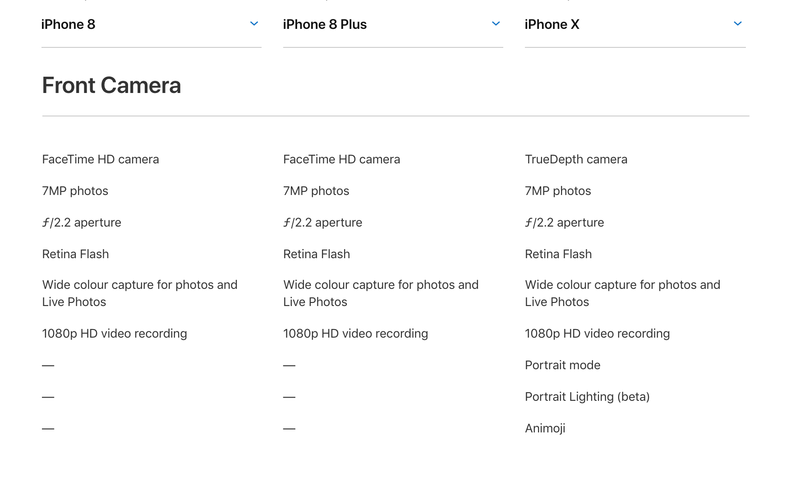 If you care at all about photography, the rear cameras on the iPhone 8 Plus and the iPhone X are nearly identical. The iPhone 8 is a great shooter, but the larger iPhone 8 Plus adds a second telephoto lens so you can zoom in without losing image quality. The only difference between the rear cameras on the iPhone 8 Plus and those on the iPhone X is that the X has optical image stabilization for both the wide-angle and telephoto lenses for sharper images, especially in low-light settings. The iPhone 8 Plus has OIS for only the wide-angle lens, like the iPhone 7 Plus before it. The only difference is that the iPhone X has a few “exclusive” software features: Portrait Mode for the front-facing camera (in addition to the back); Portrait Lighting, which lets you remove backgrounds in your selfies for a dramatic effect; and Animoji, which lets you send animated emojis to your friends that mimic your facial expressions and even speak using your voice. 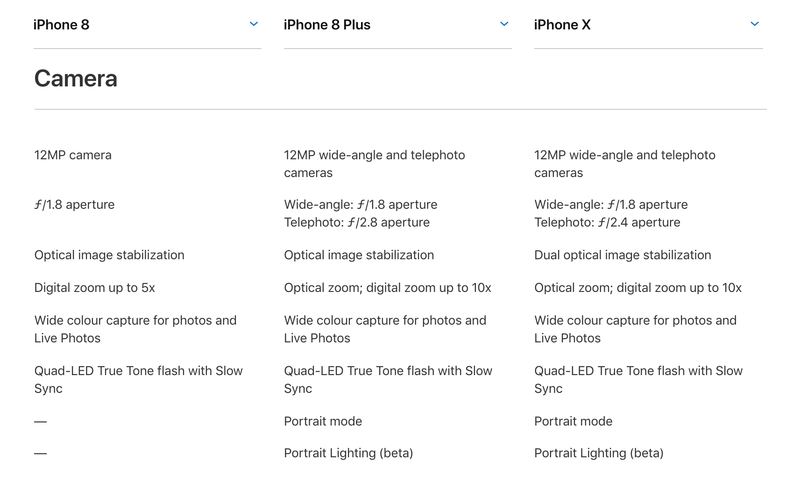 But as someone who owns an iPhone X, I’d argue none of those features are worth the price difference between the iPhone 8 and iPhone X. The TrueDepth camera system is the lone interruption on the iPhone X’s beautiful edge-to-edge display. I don’t mind the notch too much on my own iPhone X, but I still notice it all the time. This comes into play with everything: If you’re trying a new phone wallpaper, or watching a video, you always need to take the notch into account. Also, many apps still have yet to be optimized for the unique shape and layout of the iPhone X, which means for now, apps will look as if you’re running them on an iPhone 7 or iPhone 8, leaving most of the screen’s real estate unused. 8. If you’re upgrading from an iPhone 7 or 7 Plus, your old cases will fit the iPhone 8 — but not the iPhone X. The iPhone X’s dimensions are completely different from those of past iPhones, so your old cases won’t work with this phone – one more expense to consider on top of the phone’s price. The iPhone X has stunning battery life. According to most benchmarks and tests, the iPhone X gets an average of 12-13 hours of battery life, which is really, really good.